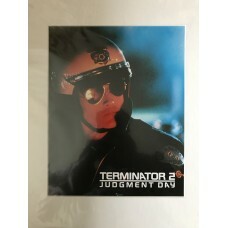 Terminator 2: Judgment Day (also referred to as Terminator 2 or T2) is a 1991 American science-fiction action film co-written, produced and directed by James Cameron. 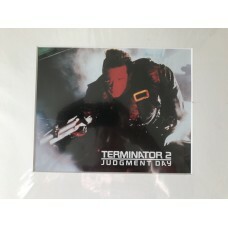 The film stars Arnold Schwarzenegger, Linda Hamilton, and Robert Patrick, with Edward Furlong also in its principal cast as John Connor. 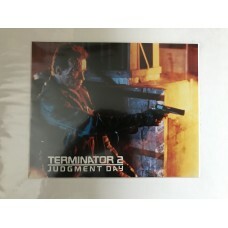 It is the sequel to the 1984 film The Terminator, and the second installment in the Terminator franchise. 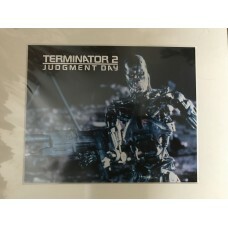 Terminator 2 follows Sarah Connor (Hamilton) and her ten-year-old son John (Furlong) as they are pursued by a new, more advanced Terminator, the liquid metal, shapeshifting T-1000 (Patrick), sent back in time to kill John Connor and prevent him from becoming the leader of the human resistance. 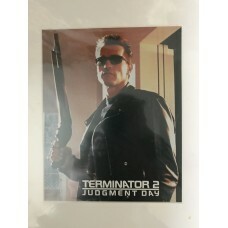 A second, less advanced Terminator (Schwarzenegger) is also sent back in time to protect John. 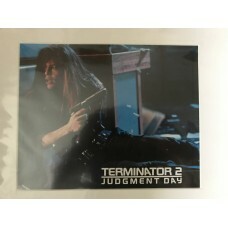 Terminator 2 - Judgment Day - Original Mounted Lobby Card 1Original 10x8 Lobby Card - Mounted in a 14x12 Inch Mount - Ready For Framing!Marks, light a..
Terminator 2 - Judgment Day - Original Mounted Lobby Card 2Original 10x8 Lobby Card - Mounted in a 14x12 Inch Mount - Ready For Framing!Marks, light a..
Terminator 2 - Judgment Day - Original Mounted Lobby Card 3Original 10x8 Lobby Card - Mounted in a 14x12 Inch Mount - Ready For Framing!Marks, light a..
Terminator 2 - Judgment Day - Original Mounted Lobby Card 4Original 10x8 Lobby Card - Mounted in a 14x12 Inch Mount - Ready For Framing!Marks, light a..
Terminator 2 - Judgment Day - Original Mounted Lobby Card 5Original 10x8 Lobby Card - Mounted in a 14x12 Inch Mount - Ready For Framing!Marks, light a..
Terminator 2 - Judgment Day - Original Mounted Lobby Card 6Original 10x8 Lobby Card - Mounted in a 14x12 Inch Mount - Ready For Framing!Marks, light a..
Terminator 2 - Judgment Day - Original Mounted Lobby Card 7Original 10x8 Lobby Card - Mounted in a 14x12 Inch Mount - Ready For Framing!Marks, light a..
Terminator 2 - Judgment Day - Original Mounted Lobby Card 8Original 10x8 Lobby Card - Mounted in a 15x13 Inch Mount - Ready For Framing!Marks, light a..